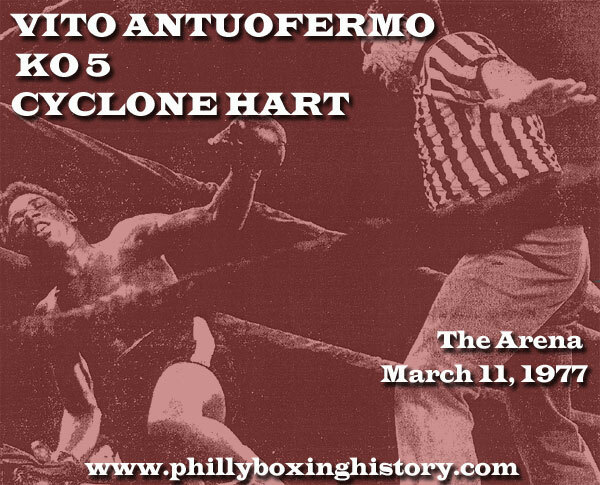 Vito Antuofermo came to town on this day in 1977 and stopped Philly's Eugene 'Cyclone' Hart by savage KO at the Arena. Hart started quickly and scored with his famous left hook often, especially to the body. But Vito fought through those shots and a cut right eye to make his own headway in the fight. In the fourth round Antuofermo hurt Cyclone with a volley of shots and withstood Hart's retaliation. It was a great round. In the following session, Antuofermo dropped Hart twice. The second time was as picturesque as KO's come. The always game Cyclone struggled to rise, but Ref Hank Cisco counted him out. The bout was an excellent and thrilling battle and seemed to signal the end of Hart's career as a serious contender. He did retire after the match only to return for one more fight five years later. Vito Antuofermo would go on to win the world middleweight crown two years later.